…..and I don’t mean the EU Referendum! 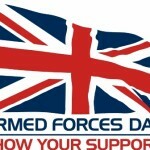 Two days after the voting I will be celebrating Armed Forces Day – a chance to show support for the men and women who make up the Armed Forces community: from currently serving troops to Service families, veterans and cadets. It is sometimes far too easy to overlook the vital role they play. 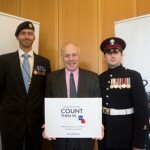 In that regard I am also delighted to be supporting a campaign organised by the Royal British Legion’s ‘Count Them In’. This is an effort to get the rules changed so that questions about the Armed Forces community can be included in the next UK Census. We currently know more about the UK’s Jedi community than we do about our Armed Forces. It cannot be right that our Servicemen and women, veterans and their families are effectively hidden from official statistics. We count on them – let’s count them in! I joined British Legion representatives at the House of Commons to help promote the campaign. It is estimated that there are currently between 6.5 million and 6.7 million members of the Armed Forces community living in the UK, representing about a tenth of the population. However, little is currently known about the exact numbers, location and needs of this significant group. Including new questions on the next census would provide public bodies, local authorities, and charities with valuable information to ensure they are able to deliver the best services they can for our Armed Forces community.